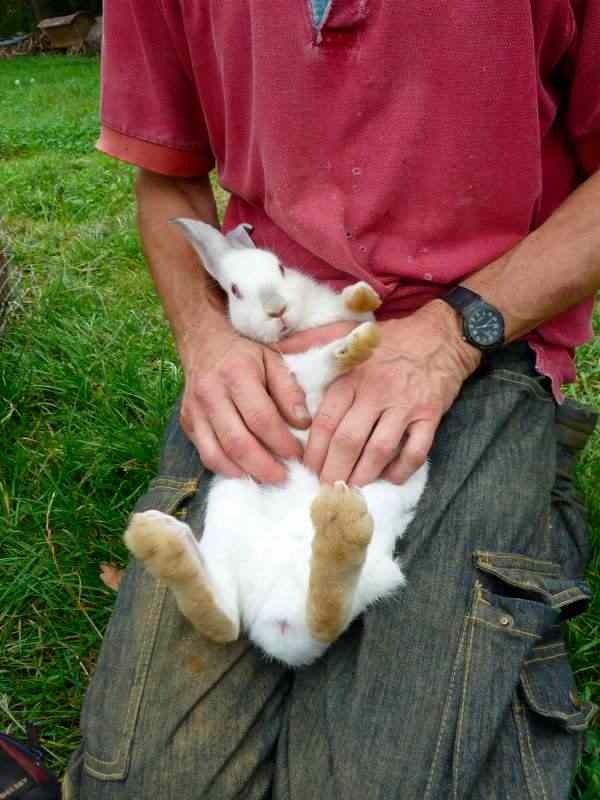 permaculture in brittany: Bunny Back from the Brink. Bunny Back from the Brink. Last week, we lost one of our litter of eight young rabbits. She went downhill suddenly and so we isolated her in the empty chicken tractor. Another one was also off her food and hunched up, so we took her away too. They were only ten weeks old and the recently bought vaccines were still in the fridge. 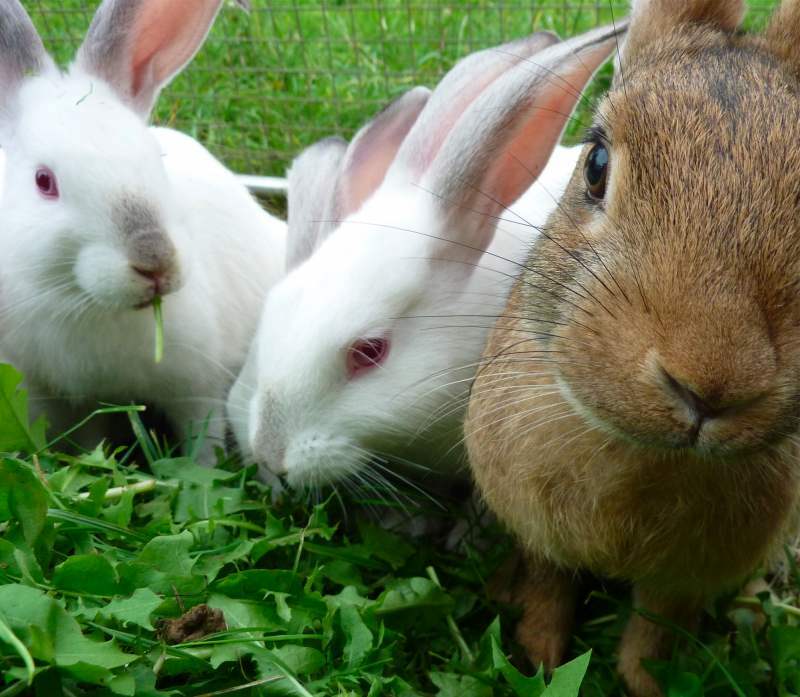 We were scared: was this myxomatosis or viral hemorrhagic disease (VHD)? 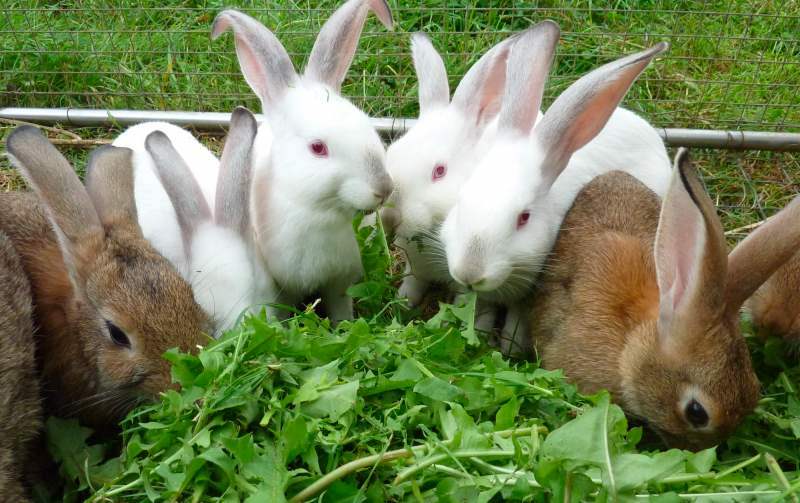 The info from our two books and the Web seem to be exclusively directed at pets, rather than rabbits kept for meat with frequent advice to rush your bunny to the vet, not economically viable for us. Happily, it didn’t seem to be VHD but perhaps gastrointestinal stasis or bloat. We followed instructions to massage the patient’s belly, monitoring her temperature, keeping her warm and hydrated and trying Simethicone for flatulence, we even gave her an enema. (If you’re interested, the Simethicone was bought at a pharmacy, in capsules. We cut the end off a capsule and sucked the contents into a syringe, to administer by mouth to the rabbit). As I said, we can’t possible call a vet every time one of our animals is in less than top form and part of being a smallholder is learning how to recognise signs of bad health and treat them ourselves and, of course, how to keep them healthy by good husbandry. By happy coincidence, our lovely vet, Dr Hammadi Mouhli, called me to tell me that he was in our area and could he come by to burdizzo-ise (vasectomise) three male lambs (as previously requested) so we asked him to take a look at the remaining poorly rabbit as well. ‘Gros ventre’ (big belly) he pronounced and diagnosed a case of Coccidiosis infection, prescribing Metoxyl in their drinking water. By the time I’d passed by the surgery the following morning to collect the prescription, she was already looking a little better. We took no chances and have administered the medicine but wonder whether our own efforts had already treated her and what, in fact, she was suffering from.